Being positive in the hard times of life will help you to overcome it sooner and effectively than being negative about it. Nothing happens for nothing. Strong unfair criticism can be very healthy for us, keeping us in check, developing us, and our effectiveness. To make our moral purpose efficient and useful, our minds must be as wide-awake and penetrating as possible. The most efficient way to lose a fight is to act without knowing your enemy. First of all observe before acting. Life in general is all about prioritization. You are constantly evaluating at any point of time, what is more important than the other at a particular point of time, or at a phase in your life. Intelligence is an elegance of excellence with an endurance of empathy, efficiency and effervescence of self-reliance with self-confidence besides an effective respect for independence and ignorance. If the mind is allowed to be sadly engaged in the past or to be unduly worried about the future, this mental weight would stop us from meaningfully using our present. And, this would reduce our efficiency and productivity. Its a give and take relation between your body and you. If you'll bless your body with health and care, it'll in return bless you with happiness and efficiency. A true leader is someone who does not only produce results and show efficiency in what he does but is also one who replicates himself by developing his people. Efficiency means the tendency of working well, without wasting time, money and resources. Building efficiency at work comes with practice; because it is only practice that makes a man perfect. Efficiency means precision, accuracy and dexterity in the particular task which is at hand. 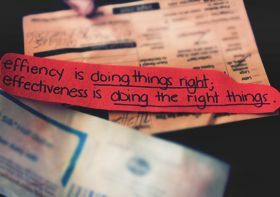 According to Peter Drucker, "Efficiency is doing things right; Effectiveness is doing the right things."